Identification: Tailed. Upperside dark brown; male without oval spot at forewing front edge. Often a dull orange tinge at outer margin of forewing and near tail of hindwing. Underside forewing with fairly straight postmedian line; hindwing with some white in the postmedian line. Life history: Males perch on host plants during warm daylight hours. Location of egg deposition on plants varies with the plant species: on American holly an egg is laid on the center of an old host leaf just before bud break, while on redbud eggs are laid on flowers and buds. Caterpillars eat buds and young leaves, and pupate in litter at the base of the host plant. Chrysalids overwinter. Flight: One flight from February-May. Caterpillar hosts: Diverse plants: Texas persimmon (Diospyros texana) in Texas; dahoon (Ilex cassine), American holly (I. opaca), and yaupon (I. vomitoria) in Florida and North Carolina. Redbud (Ceris canadensis), huckleberries and blueberries (Vaccinium species), Mexican buckeye (Ungnadia speciosa), and Viburnum species are selected in other locations. Adult food: Where redbud is the caterpillar host, its flowers are the main nectar supply for adults. In other places, flowers of plants that are not the caterpillar host are used for nectar including willows, wild plum and hawthorn, and Forstiera. 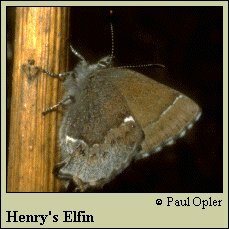 Habitat: Edges and openings in barrens and near pine or pine-oak woodland. Range: Maine west through southern Canada to Wisconsin, south to Texas, the Gulf Coast, and central Florida.